Our super talented Gayle prepared a stunning art journal spread inspired by a difficult situation I am sure all of us have faced. It is so good to be back here in Finn Team again for another year. I am very excited to be working alongside some wonderful new “creatives” and very thankful to Anna for inviting me back. I would also like to thank all of you who have left me some of the most amazing, kind and inspiring comments over the past months (some made me cry, but they all made me feel very humble and I am so very, very appreciative.) Thank you. I have tried to get back to some of you to answer questions you have for me, but can not always find a link, so I have left a comment on the blog instead. This month I have kept things simple and done a journal page. Do you ever suffer from saying the wrong thing at the wrong time to the wrong person? In Australia we call this “Foot in mouth disease”. My journal page is a reflection of this - when, being a little excited, you have said something in good faith to someone and you do not get a reply. You look at them out the corner of your eye, and, at that point you realise you have said the wrong thing. Words are the source of misunderstanding. You are embarrassed and straight away apologies start forming in your head. 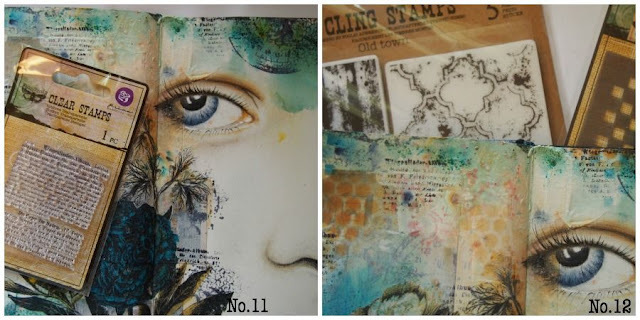 I have used all my favourite things: Finnabair ArtBasics mediums, stamps and stencils along with collage. The colour this time comes from mediums I do not usually work with - Magical Powders from Lindy’s Stamp Gang and regular old colour pencils. These two things have created a muted, soft colour palette. No.1 Sketch in the face. 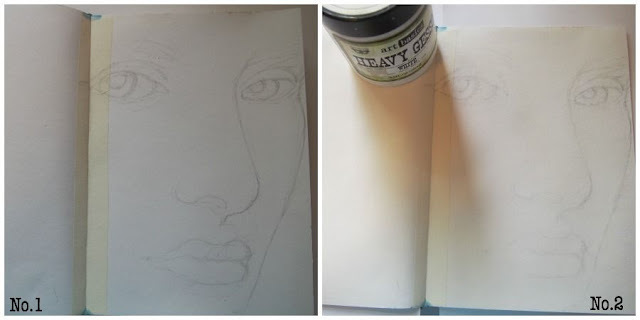 If you don’t feel you can draw a face, copy one. If you don’t feel you can copy one, trace one. If you don’t feel you can trace one, use an image transfer, or a photo or a magazine picture. 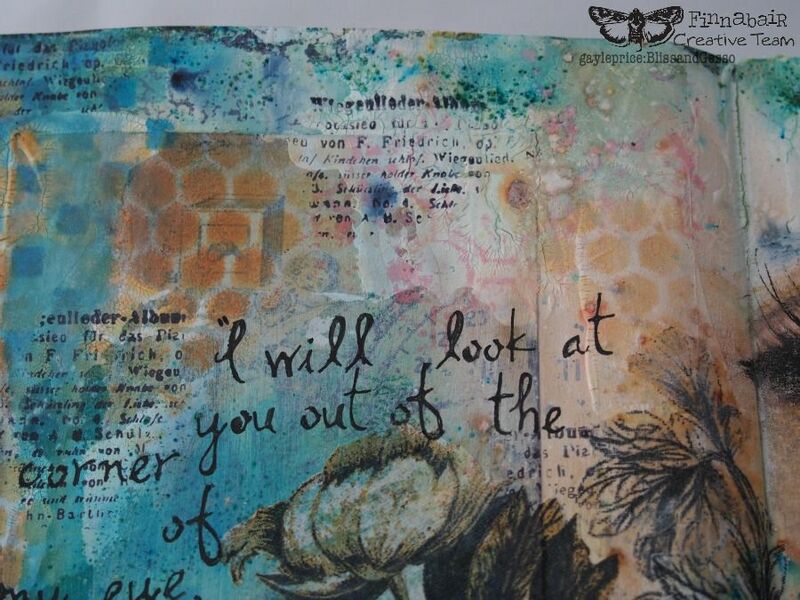 That is the beauty of art journals - there are no rules; you can do whatever you want in it. No.3 I’ve used images from Finnabair’s beautiful new Ephemera pack “Melange”. These were pasted down with 3D Matte Gel. Sadly, they have been “lost” on the page because I forgot to do one very important thing - to give them a coat of Clear Gesso to protect them from the next layers of gesso, paint and ink. 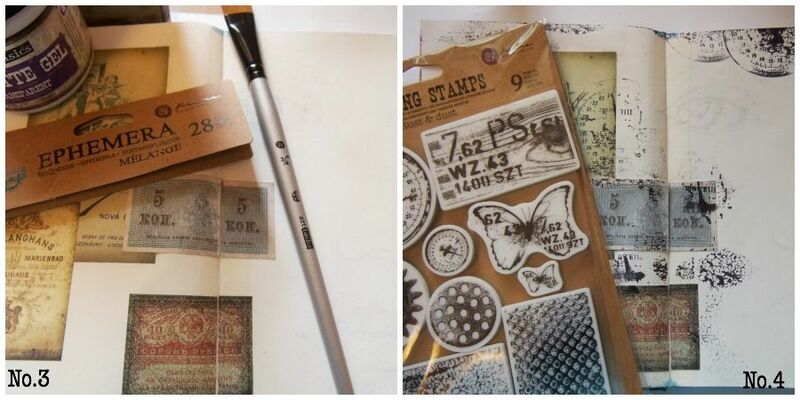 If I had done this, then, by using a baby-wipe, I could have wiped away the gesso, paint and coloured ink and revealed the beautiful writing and images on the ephemera and have it shine through. 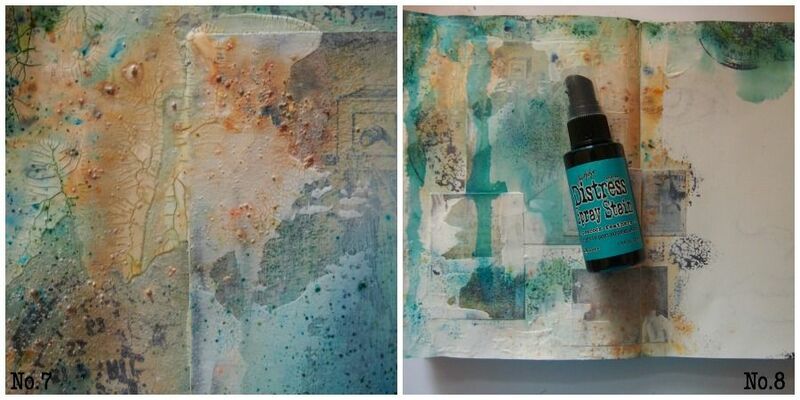 No4 Stamping using waterproof ink and stamps from Finnabair’s “Rust and Dust” set. 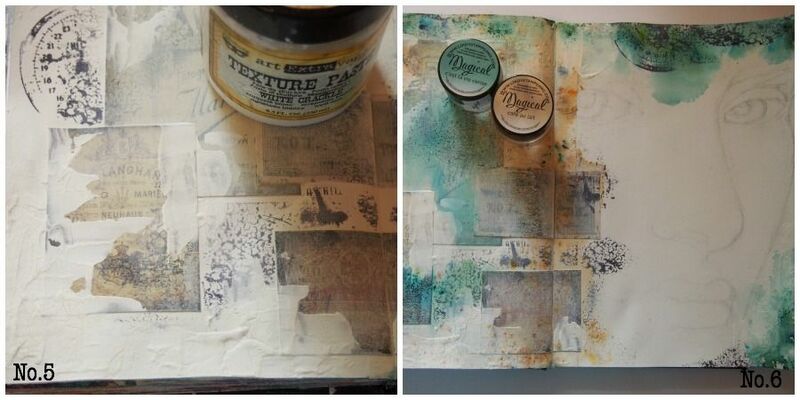 No5 Add Art Extravagance White Crackle Texture Paste around the edges of the page. No6 Mist the pages with water and sprinkle on the Magical powders. No7 I love how these Magical powders stay in little dots and blobs and also how the colour seeps into and shows up the Crackle Texture paste. No8 I had to intensify the colour a little, so added some Distress Spray Stain dribbles. No9 Coloured pencils to colour the eyes, nose and lips. No10 Collage on some tissue flowers using Art Basics Soft Matte Gel. No.11 More stamping with Finnabair Clear Stamps. No.12 Lastly, some more surface pattern using ink dabbed on through a Finnabair stencil and stamping (in pink, you can just see it) with a stamp from “Old Town” set. I’ve used 3 different colours of ink through the stencil: a light honey colour, a darker Sienna and a deep blue. White Crackle Paste… my favourite medium. 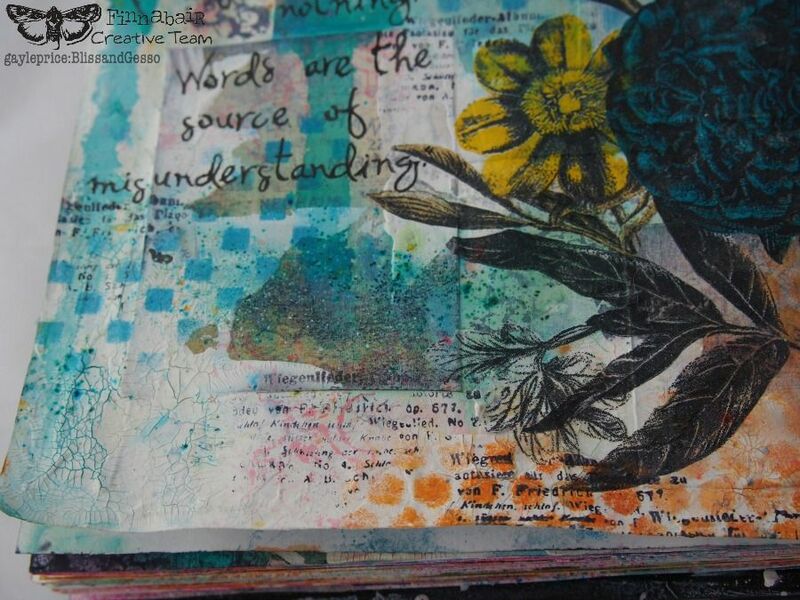 Layers of stamping, collage, stencilling and texture paste along with the softness of coloured pencils. Thank you for looking today. 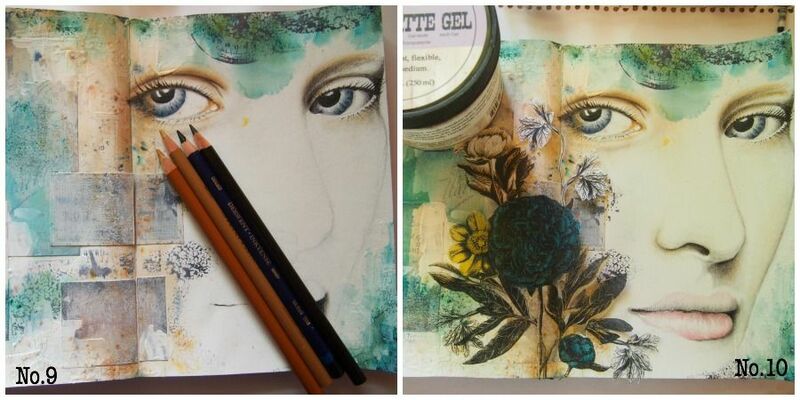 I hope you will feel inspired to go and play and experiment in an art journal. And remember: if you make mistakes it doesn’t matter! This is absolutely beautiful! Love the colors and the message.Thank you for sharing! In the U.S., we also have 'foot in mouth' disease which I have suffered too! what an incredible artist you are ! Gayle your face is absolutely stunning and the creativity around it is fabulous . 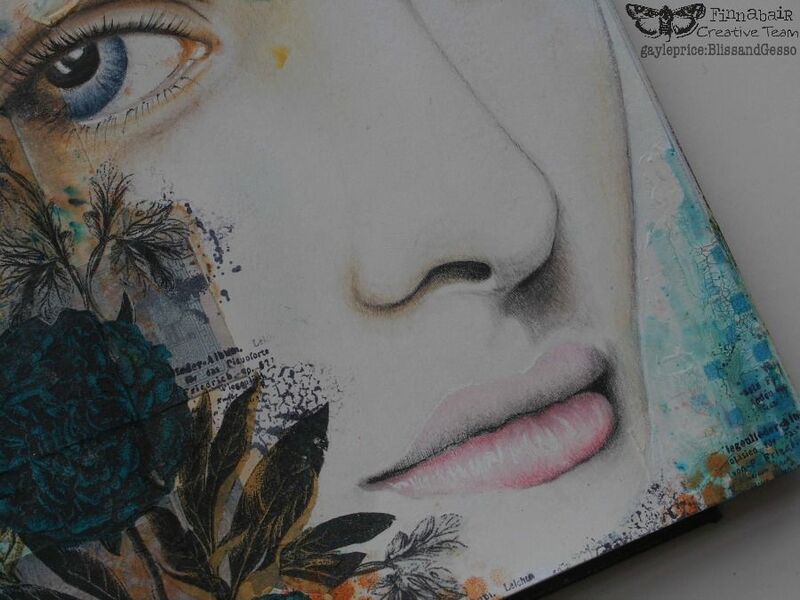 I love how your page is inspired by your reflections - thats my kind of journaling and I thank you so very much for sharing your talent . 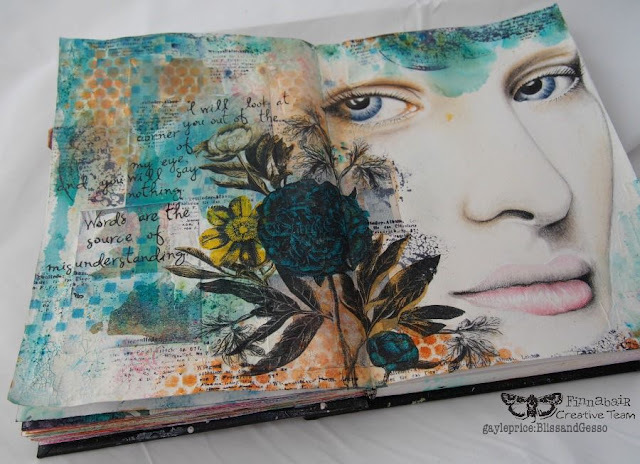 Your journal pages are so gorgeous and the face is beautiful. I love the colors and textures you have created. And, as always, I am in awe of your many talents and appreciate that you share your processes! Beautiful page! And the face is just stunning. Thanks for sharing your process! INCREDIBLY LOVELY in every way Gayle. You have such a fabulous sense of how to layer in just the PERFECT way - the placement, the colors - it's amazing to see. And I totally laughed out loud at your No. 1 on the tutorial. You are right - no excuses - we CAN do a face even if we think we can't - which would be me!!! So amazing how you just sketched her on there and she turned out absolutely flawless - she is GORGEOUS. You are just soo sooo talented. Love this and thank you so much for the FAB tutorial too. j.
I love your journal page! Wonderful page I'm loving all the texture! Stunning Gayle! Thanks for the inspiration! Going to give it a try! Fabulous! Simply love your art ! Gayle your work always leaves me breathless!